Monday: Super Bowl leftovers! I enjoy making Chicken and Avocado Soup with them. Another suggestion is using leftover crudités in a salad or a soup, leftover salsa can be used in slow cooker chicken tacos, any leftover cooked/uncooked veggies in a frittata, method here, or quesadilla, method here. Little tortilla chips are delicious sauteed with eggs and pico de gallo. Chili can be served over baked potatoes or roasted sweet potatoes. Lastly, leftover corn tortillas are perfect in this easy tortilla soup. Tuesday (Lunar New Year): The first meal of the Lunar New Year is generally cooked eggs. The yolk and egg white represent gold and silver. Here is an egg salad recipe along with other ways you can incorporate eggs into your dinner. You can also make vegetables fried rice with egg. My kids love the Asian Slaw with Asian Turkey Lettuce Cups. Easy Chinese Chicken is also great for a weeknght Though, traditionally serving a whole chicken or bird represents reunion and rebirth in the new year – here is my whole cooked chicken method ! You can also refer to this post for more fun ideas. Wednesday: Chickpea Socca with Mediterranean Salad , add your favorite protein if you’re extra hungry. You can also skip the feta if you want and drizzle tzatziki on top, method here. Here’s a link to my previous dinner planners. 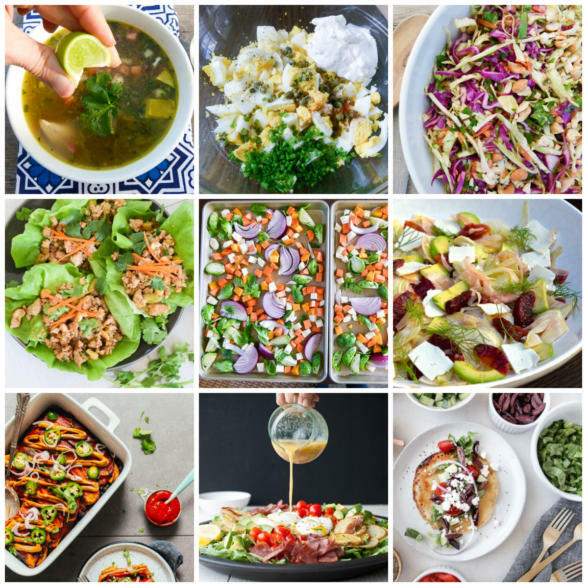 I have LOVED seeing all your creations of my recipes on Instagram. If you make any of my recipes, please tag me @pamelasalzman #pamelasalzman so I can check them out! Click here to learn more about my online cooking classes! If you like my recipes, you’ll LOVE my cookbook!